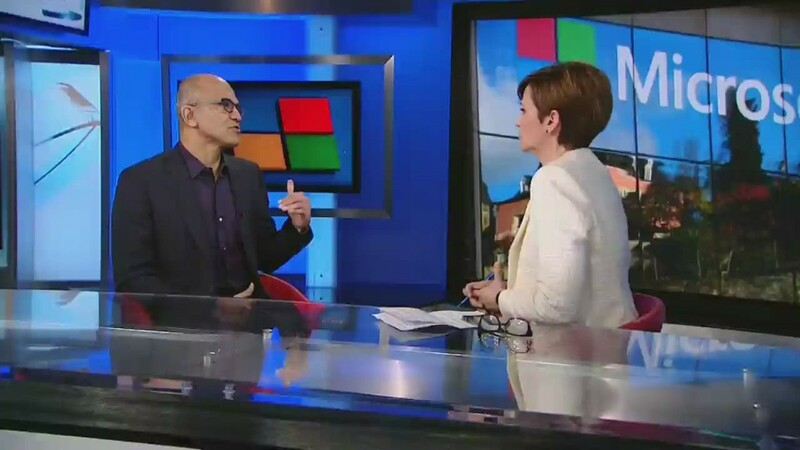 Is Satya Nadella a better Microsoft CEO than Bill Gates? Is Microsoft CEO Satya Nadella better than Bill Gates? Hey! You! Get onto my cloud? That little twist on the classic Rolling Stones tune could be the theme song for Microsoft these days. Thanks in large part to CEO Satya Nadella's cloud strategy, Microsoft (MSFT) is suddenly the cool kid on Wall Street once again. Microsoft's stock is up 18% this year -- well ahead of the broader market, and also better than rivals Apple (AAPL), Oracle (ORCL), IBM (IBM) and SAP (SAP). Shares are up nearly 60% since Nadella took over from Steve Ballmer in February 2014. That's more than double the gain of the Nasdaq during the same time frame. The stock hit a new 52-week high on Tuesday and is now less than 10% below the all-time high it hit way back in December 1999. Think about that for a second. Microsoft may soon surpass the heights it enjoyed during the Bill Gates era. Could Nadella turn out to be Microsoft's best CEO ever? It's way too soon to say just yet. Let's check back in another 10 years. But many investors are just like Janet Jackson. What have you done for me lately? And Nadella is clearly delivering on that count. So there will probably be a lot of happy Microsoft shareholders at the company's annual meeting on Wednesday. Ives notes that Nadella has emphasized cloud products like Office 365 and Azure -- the Web hosting service that competes with Google (GOOGL) and Amazon's (AMZN) lucrative AWS division. And Microsoft made its new Windows 10 operating system cloud-centric. Ives added that it was a "genius move" for Microsoft to offer free downloads for Windows 10 and listen more to developers and customers than it did in the past. That may sound simple. But Microsoft historically has not been known for being the most user friendly of companies. That has quickly changed under Nadella. "We are pretty enthusiastic about the company's prospects," said Eric Schoenstein, co-portfolio manager of the Jensen Quality Growth fund, which owns the stock. "It may be an intangible. But it feels like the company is more transparent under Nadella. His style is different and less aggressive." The numbers bear this out. Cloud sales boomed in the latest quarter. And even though overall revenue was down as the company transitions away from the old model of selling software, profits rose. Still, it may get tougher for Microsoft to impress Wall Street. Expectations are higher now that Microsoft is no longer a loathed stock the way it was during the end of Ballmer's tenure. Colin Gillis, an analyst at BGC Partners, said that Nadella has already taken care of cleaning up the mess created by Ballmer when Microsoft bought the smartphone business of Nokia (NOK) in 2013. Microsoft took a $7.5 billion charge in July to write down the Nokia deal. Nadella also announced a second wave of layoffs -- mostly in the Nokia division. Microsoft cut 7,800 jobs this year on top of the 18,000 announced in 2014. "Nadella put Nokia behind them. It was painful, but it's better than having it linger," Gillis said. But Gillis thinks PC sales throughout the industry have to pick up further in order for Microsoft's stock to keep rallying. That would prove that Windows 10 really is pushing consumers and businesses to upgrade from older machines. He also thinks Surface sales need to be big during the holidays. Gillis has a "hold" rating on the stock. "It's had its run," he said. Microsoft is starting to look a little expensive. Shares trade for 20 times fiscal 2016 earnings estimates. That's one reason why one portfolio manager says he no longer owns Microsoft. "The price got away from us. We wouldn't buy it now," said David Bahnsen, a managing director with HighTower Advisors. Bahnsen said he owns chip leader Intel (INTC) instead. It's a better value (trading at 15 times next year's earnings forecasts) and it should also benefit if Windows 10 leads to a big PC upgrade cycle. But as any tech investor knows, momentum has a funny way of lasting for a long time. And Microsoft seems to have it on its side right now. It may be unwise to bet against it as long as Nadella is working his cloud magic. "It has been a great year for Nadella/Microsoft, and we believe the stage is set for a 'renaissance of growth' to return to Redmond," FBR's Ives said.